"A hugely impressive and immensely moving novel. Somehow it feels effortless, although clearly that is not the case...Fiction of the very best kind." "A God in Ruins is Kate Atkinson's brilliant follow-up to Life After Life...This time, Atkinson has written what looks like a big, old-fashioned book, with just enough high-concept risks to make readers start riffling back through the pages as soon as they've done...readers...are never quite in the same condition when they finish a book. When it comes to a novel like A God in Ruins, that change will always be for the better." 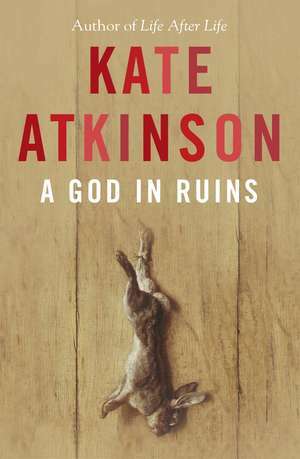 "A God in Ruins is another triumph for Kate Atkinson...A God in Ruins has a compelling narrative, a myriad of unforgettable scenes, and a bit of the old Atkinson playful craftiness at the very end, a mischievous Ian McEwan-like investigation into the curious ways of fiction writers. Altogether dazzling, A God in Ruins is my pick for the best (so far) novel of 2015." "Magnificent...Atkinson fluidly executes these chronological loop-de-loops, leaving a reader to marvel at that most banal of epiphanies--how fast life goes by." —Maureen Corrigan, NPR's "Fresh Air"
"will leave you turning back the pages, wanting to live it again, mixing up past and present in a delightful bold manner."